The light shapes our days. Narvik, Norway, is a tale of contrast. December and January are a perpetual dawn. On an evening in April, the sun was unwilling to set, lingering above the mountains a few fjords away with the stubbornness and vigor of a child avoiding bedtime. At 9 p.m. I stood in an area called Mørkholla—"The Dark Hole"—about a 30-minute skin from the chairlifts near the top of 4,000-foot Tredjetoppen at Narvikfjellet Ski Area, which, though it has just a few lifts, has the best lift-accessed skiing in Scandinavia. Kids from the small harbor town slapped slalom gates while others lapped the gondola or went for walks along the cat track with their dogs. We saw a few other backcountry skiers, but it didn't require much effort to find untracked snow. It was a Tuesday night. The lifts run from 5 to 9 p.m. during the week—without the use of floodlights this time of year. In most places, people go to the gym or for a run after work. In Narvik, they start their ski day. The scene felt casual, but the skiing, not to mention the backdrop, was anything but. Our group of five, including local Micke Af Ekenstam, Mattias Fredriksson, Hennie van Jaarsveld, Johan Jonsson, and Chad Sayers, came to explore the captivating history and unheralded skiing of a town on the brink of an identity change. We were floored, overcome by what we saw. Beauty unlike anything I had ever seen before. Distance in Northern Norway is measured in fjords, which split the mountains like cracks in ice. Sunlight pierced the clouds, turning the scene into a staggering glow of pink, purple, and orange. The sleepy town of Narvik and the Ofotfjorden—the nearest fjord—were still, with the exception of a slowly moving train far below that pulled 68 cars of iron ore to the harbor. Ekenstam, 45, a local energy consultant and mountaineer who knows these mountains as well as anyone, dropped into a steep, 2,000-foot slope after the train went by. The lean, bald Swede arced technical, powerful turns on tiny ski-mo sticks while flitting through creamy, cold, untouched gold. Following Jonsson, I pointed my skis downhill and pushed forward to the fjord below us, from which the prow of a World War II battleship protruded from the water. As time has passed, it has sunk farther and farther into the sea. After easing through a narrow section of snow between rocks, I made big, dumbfounding turns through the amber-colored powder. It was after 10 p.m. when we got back to our cars, a perpetual dusk lingered in town. The sun would come up again in five hours. 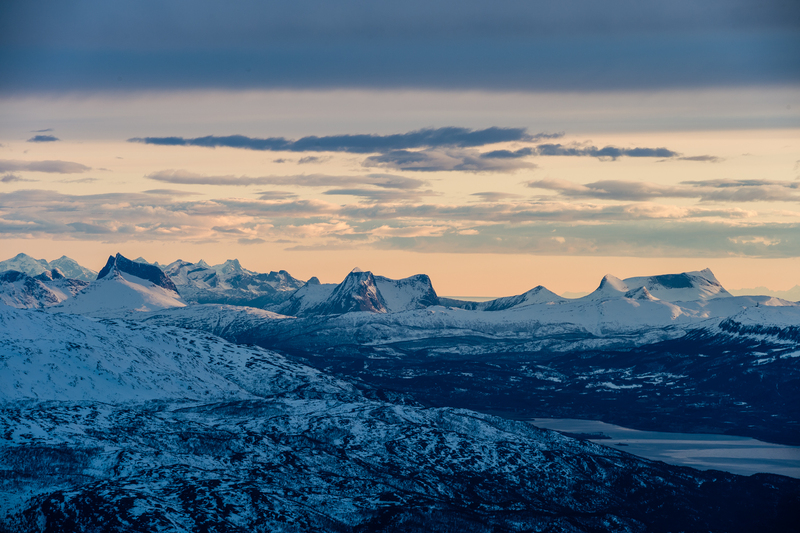 Between the fjords in northern Norway are isthmi full of rarely skied snow-covered peaks. It was sunrise, 75 years ago, when 10 German destroyers approached the Ofotfjorden from the Norwegian Sea to initiate a bloody battle that would alter the course of World War II—and leave scars on this quiet port town and the mountains that surround it. Hitler had recently occupied Poland and he decided to delay a French invasion in order to first control another essential asset: the iron ore sent from the Kiruna Mine in Sweden by rail to Narvik, where it was shipped all over the world. Nearly 1,000 miles north of Oslo, Narvik is one of the most northerly towns in the world, sitting 140 miles within the Arctic Circle. Most foreigners come for Northern Light viewings and to interact with wolves, arctic foxes, and reindeer in the nearby Polar Park. The ski area is popular among skiers coming from Riksgränsen, in Sweden, the more internationally famous Scandinavian ski destination 30 miles to the east. For more great ski stories, subscribe to a year (six issues) of “The Skier’s Magazine” for just $14.97. Though it isn’t well known, the region is essential to the history and evolution of skiing—for transportation, military application, and, eventually, recreation and sport. Five-thousand-year-old Norwegian petroglyphs depict skiing. A famous painting from 1206 dramatically shows two men from the Birkebeiner party—a rebel group—rescuing 2-year-old Håkon Håkonsson, the future king of Norway, on skis. Scandinavian military groups used skis throughout the 1700s. Telemark, Norway, was the center of skiing in the 1800s, producing the first shaped skis, and the first public skiing competition was held in Tromsø, 150 miles north of Narvik, in 1843. The history of Norway's statehood is much shorter. A union within Denmark and Sweden for centuries, it declared its independence as a country in 1905. Norway's declaration of neutrality figured to insulate it from World War II. But on a stormy spring morning during the dawn of the war, Nazi Germany quickly devastated that expectation, as well as the country's newfound autonomy. It was windy, foggy, and snowing the morning of April 9, 1940. Visibility was limited as Germany positioned its fleet. It was a surprise and deadly attack. Less than an hour into the battle, 282 Norwegian sailors died. By the time the 9,000 residents of Narvik woke up, 2,000 Nazis had occupied their quiet haven. 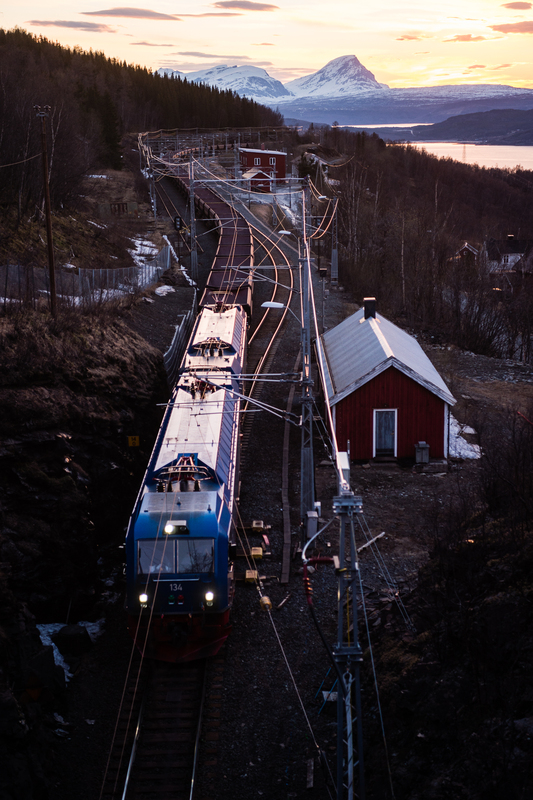 Narvik is inextricably linked to World War II because of the 68,000 tons of iron ore that arrives every day on electric trains from Sweden. One day later, help arrived. The HMS Hardy and four British destroyers entered the harbor. Poor weather persisted, aiding the Allies' offensive. Amid heavy naval warfare, the Nazis sunk two destroyers, but lost two of their own as well as seven merchant ships. Commanders of both sides died. The battle continued on land, spreading through the mountains surrounding Narvik. Skis were essential to effective fighting. Narvik evacuated 4,500 of its citizens as planes bombed the town. Photos show Narvik ablaze. Eventually the Allies brought 24,000 troops into the area, from Poland, France, Norway, and England. On May 8, Narvik became the first city recaptured by the Allies, but freedom wouldn't last long. On May 10, 1940, Hitler invaded France. Even though the Allies had pushed Germany to the fringes of Norway's border, Allied troops were ordered to mainland Europe. The Battle of Narvik was over, and the region fell back into Nazi hands. Norwegian resistance groups popped up throughout the country, but Nazi occupation, and Norwegian oppression, would last until Germany surrendered on May 7, 1945. The sun moves at a different pace in Norway, making for long, epic sunsets. 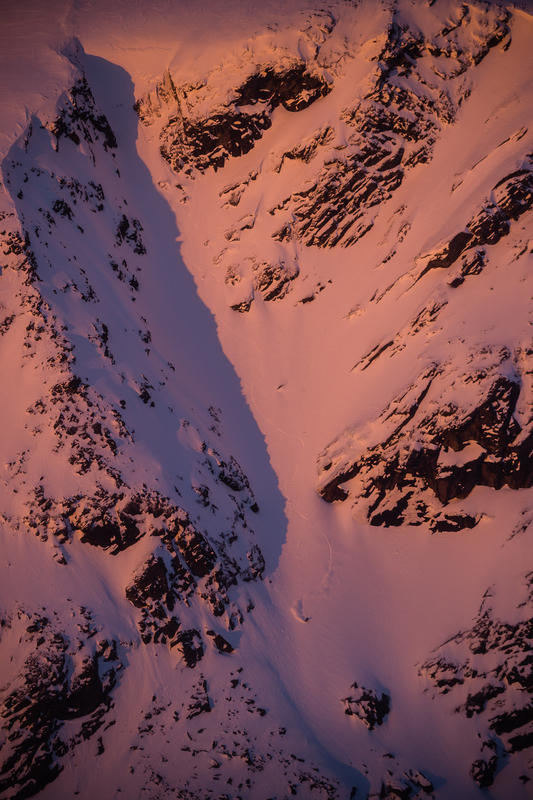 Chad Sayers milks the late light near Narvikfjellet Ski Area. One morning I drove along the Beisfjorden, one fjord away from Narvik. We passed through the town of Beisfjord, known for one of the worst massacres of the war. In 1942, 900 Yugoslavian prisoners of the Axis arrived in Narvik. They were marched to Beisfjord, where they built their own concentration camp. A month later, 588 of the prisoners were deemed healthy and hiked to another prison (242 of them were eventually shot anyway). The remaining 288 in Beisfjord were killed in groups of 20. Those who were too weak to move were put in two barracks that were doused with gasoline and set on fire. I kept driving another 10 minutes past the town on a dirt road until I reached a parking lot near a stream. I put on ski boots and, following Ekenstam, shouldered my skis, walking along a muddy path across wooden footbridges. Morning light lit up the forest. The sky was cloudless. Ekenstam met Fredriksson, a fellow Swede and our photographer, while housekeeping in Riksgränsen 23 years ago. He moved to Narvik in 2001 to be with his longtime girlfriend, a physical therapist. Ekenstam, a former professional skier, has since written three books on skiing and climbing in the region. Stoic, calm, quiet, and strong, he was easy to trust as we skinned ribbons of snow and scrambled across rocks covered in inch-thick moss. "A very Norwegian approach," he called it. After three hours, we bootpacked up a steep snowfield and arrived at the top of Tverrdalsfjellet, a number of breathtaking peaks surrounding us. We slipped into the dirty entrance and carefully peered over the edge. We skied to a crack in the rocks, a favorite line for Ekenstam, and one he shared with the late JP Auclair and Andreas Fransson. It was easy to see why this chute was marquee. 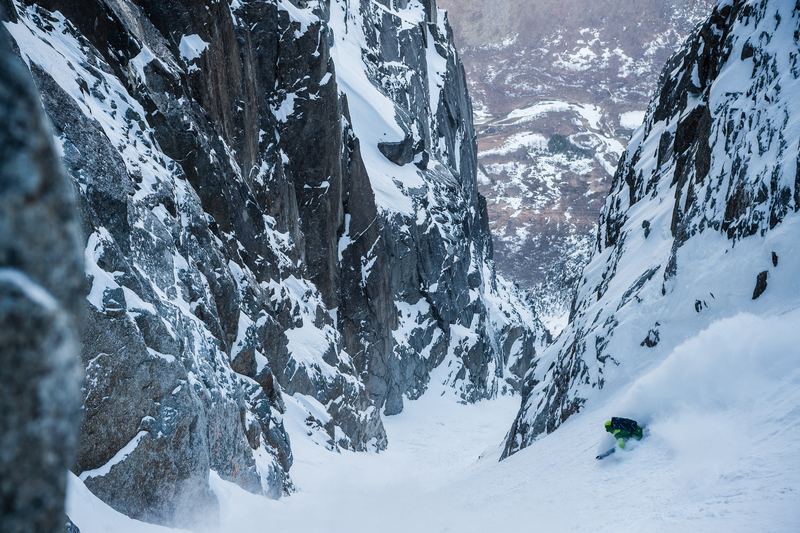 The 1,300-foot couloir, called Skamdalsrenna, had 500-foot-tall sheer walls on both sides. A ski-width 45-degree entrance doglegged to the left, then became so steep we couldn't see anything below. We slipped into the dirty entrance and carefully peered over the edge. It was a devastating couloir. The snow stuck to a narrow, 50-degree slope for 150 feet, before leaning hard to the right. Ekenstam had skied it in powder with Fredriksson and Sayers three days before. But the temperature warmed. Recent rockfall littered the snow. Large boulders and cornices lingered ominously on top of the dark walls. We decided to turn around. When we got back to Narvik, we ate a big Italian dinner at a busy restaurant in town—a break from the local salmon we ate every morning for breakfast—then put on our ski boots. We loaded the gondola, then the double chair, and took in another sunset among the fjords from the top of the mountain. The chairlifts had stopped spinning by the time we made our descent at dusk, around 10:30 p.m. We were the only ones left on the mountain. A few wispy white clouds hung around in an otherwise navy blue sky. The snow was scratchy—a firm, refrozen field. We skied lightly until we hit the groomer and sped back down to the empty dirt parking lot. 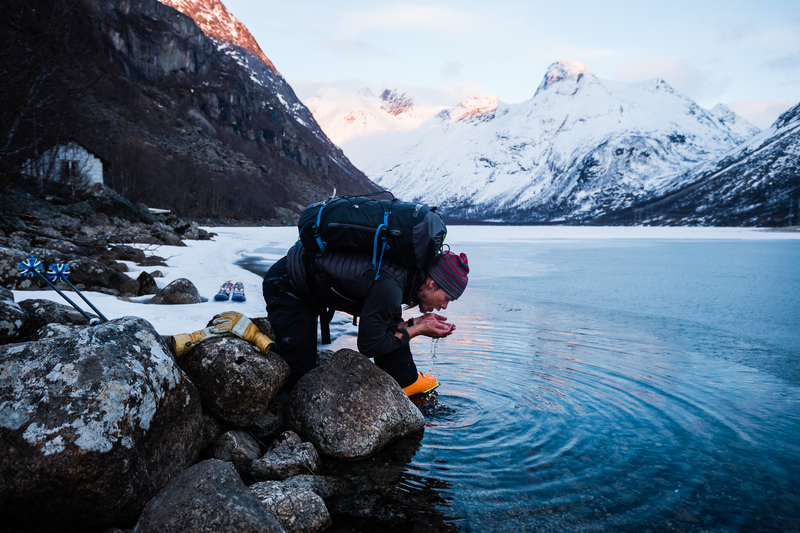 Chad Sayers in the abundant natural resources of Northern Norway. 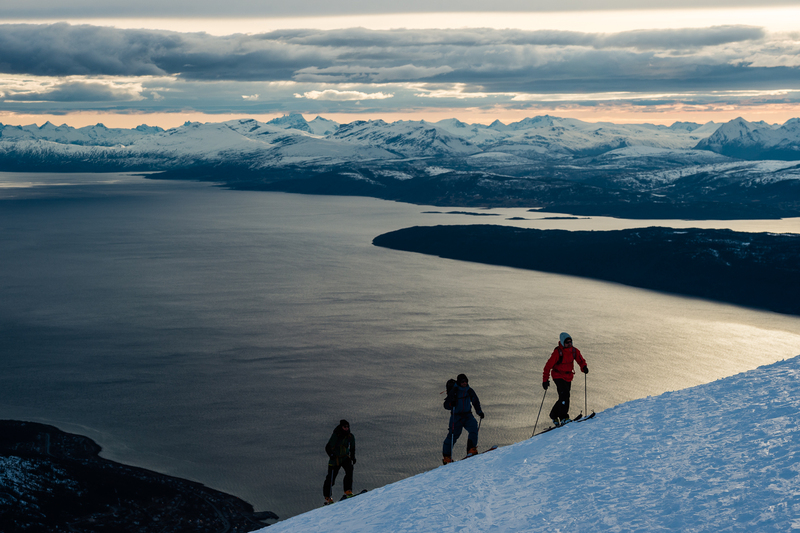 Though nearly everybody there skis, and the location is singularly stunning, Narvik is not a tourist town. A small college attracts youth, but the town has only a handful of restaurants and bars. It is sleepy and gray and industrial. The mines still send 10 trains a day, with a total of 68,000 tons of iron ore in the shape and size of marbles. Called LKAB, the company ships 20 million tons of iron annually. The town is quickly changing, determined to emerge as an international tourist destination. Through an old friend, a skier who now works for the company, Jonsson got us beyond the layers of security and into the facility. Wearing a helmet with goggles, rubber boots, and a long lab jacket, required attire for entry, I stood 300 feet off the harbor, where a control center sits perched at the end of the last conveyor belt that dumps the iron into ships. The small office was surrounded by windows. Behind us, the massive machinery was a reminder of the formidable industry that runs the world. In the foreground, we had a view of the Ofotfjorden and the beautiful mountains beyond, including Narvikfjellet and Sleeping Queen, a test piece for backcountry skiers. We could also see all of Narvik, much of which is under construction. The town is quickly changing, determined to emerge as an international tourist destination. A new bridge across the Rombaksfjorden will cut the hour drive from the Evenes airport by 20 minutes. Next door to a new 16-story hotel, called the Scandic, is a new modern library, the bottom floor of which houses a new World War II museum. Renderings show a plan to build a gondola that will take skiers from the main street midway up Narvikfjellet, which is itself leveling ground to build more homes along the lower slopes to help pay for sorely needed upgrades. Chad Sayers skis the Skamdalsrenna in powder. Just days later, when the author arrived after a full day’s approach, warming temperatures and rockfall turned the group around. One afternoon at the top of the chairlift, near where skiing soldiers had taken cover from enemy forces, we attached skins to our skis. Along the path, Ekenstam found a three-and-a-half-inch-long bullet. We skied down a ridge flanking "The Dark Hole," then down a mellow slope to the north, about 750 feet to snow-covered Lake Fornesvatnet, Narvik's water source. We walked across the lake and skinned up a large, steep gully surrounded by big rock walls and exposed couloirs Ekenstam hopes to ski. Many he already has. Midway up a warm, steep climb, we rested on an island of rocks. Ekenstam passed around a chunk of reindeer jerky we whittled into slices with his knife. Once at the top, we skied still farther from the ski area, to a wide snowfield that narrowed to a couloir. The snow was so firm that Sayers ripped his binding off his ski on his second turn. The ski quickly picked up momentum and became lost amid the abyss of cliffs and crevasses. Sayers, always up for an adventure, happily made the rest of the sporty 3,600-foot descent on one ski. While he worked his way downslope, we took our time at the top of our final ski. It was sunset again. The clouds, fjords, and snow on fire. We all skied down at once. We were near the end of our trip, not to mention the season. We had come far, and the descent felt light and joyful. The group zipped down spring corn, over moss, through the tight birch, and eventually to a trailhead. The path led over a tunnel. As we stepped out of our skis, a train approached. It blasted its horn as its empty cars traveled directly beneath us, back toward the mine. The author, Johan Jonsson, and Micke Af Ekenstam make the short walk from Narvikfjellet Ski Area to “Mørkholla”—the Dark Hole. On a Saturday morning, the lifts running at traditional operational hours for the weekend, I climbed into the gondola, which has four, three-car clusters that limit uphill capacity to a crawl on busy powder days (we didn't have to wait in a single lift line all week). Inside, I met Christoffer Bergesen and Andre Olsen, 23-year-olds who grew up in Narvik and still live here because they love skiing. Olsen and I, skiing on tech bindings, which are ubiquitous here, followed Bergesen on a jump line, slicing over rocks and through trees from one air to the next. On the T-bar, Bergesen, a plumber, explained how most locals feel about skiing at Narvik. "Everybody here skis, but they take it for granted," he said. "They need to replace the lifts. They're too old." He spoke of the future here, which seems to be coming quickly. "It's happening. We just need the people to show up." After skiing a few laps with Bergesen and Olsen, each one with a few more of their friends, we followed the music. At the top of the gondola, a deck with the best view in skiing hangs over rocks and wraps around a restaurant. A stone's throw away, Olsen, Bergesen, and about 25 of their friends, all of whom were in their early 20s, sat on snow benches they had made with their shovels. Though the deck was full, this was the better party. They drank Norwegian beers called Aass ("John, how do you like the Aass? "; "John, can I get you some more Aass?"). They chanted, sang, laughed, and yelled, "skål!," their equivalent of "cheers." It was a bright, easy spring afternoon, and we could see fjords and mountains stretching for eternity. Directly below us was the harbor. On the right side, LKAB was loading a massive freight ship with iron ore. On the left, Olsen pointed out a dark shadow in the sea. It was a sunken World War II battleship. This story originally published in the November 2016 issue of POWDER (45.3). Subscribe to the magazine here.